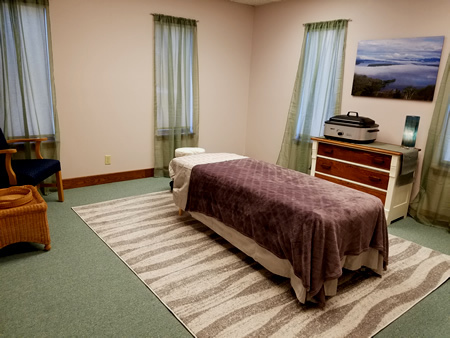 Therapeutic Massage - Your massage will be tailored to your individual needs based on an in-person interview and your completed intake form, using my extensive knowledge of the body and experience. Please refer to the education section of my website to see what I have studied. An expecting mother's body is going through many changes. Im knowledgeable of how to position an expecting mother for comfort during the massage, as well as knowing how to relieve many common aches acssociated with pregnancy. HotStones are a great way to help your muscles warm up more quickly to ease tense muscles. This technique improves relaxation. This hotstone massage is a combination of hotstone placement and therapeutic massage. Enjoy your massage with a loved one. Couple's massage is available only with advanced request, as I need to contact other local therapist to join me at my office. This option is not available through online booking. Each therapist is to be paid separately. Kinesio® Tape is used for sprains, strains, bruising/edema, scarring, over use/under used muscles, as well as posture. The Kinesio® Tex Tape Method helps facilitate the body’s own natural healing, it speeds up the healing process without limiting range of motion. The best part about it is the movement helps the tape be more effective, so you can keep doing the things you love! Event or work place chair massage is $85 an hour, with a requirement of a 2 hour minimum. Both of these require a diagnosis and referral from your Doctor. Online booking is not available for this treatment. Please call, so we can gather and file all the necessary paperwork and obtain approval before the treatment.